Today Big Buddha is offering a pair of their Kimie flats, to one lucky winner! For one entry, be a follower of Sometimes Sweet, and leave a comment with your name and email address. And for a third entry, blog about this giveaway, leaving one more comment with that link, and your name and email again. Feel free to use the images above. So, you have THREE ways to win each day, via three separate comments! I'll choose today's winner at 8pm tonight, so check back later today. And then be sure to come on back tomorrow morning at 8am for tomorrow's shoe giveaway! p.s. be sure to check out Big Buddha's new blog to stay on top of all of their newest styles! Oh goodness I love these, too. These are the cutest flats EVER! I'm a (new) follower! These shoes are too cute. i follow your blog on google reader... and I love this shoe! and the color! amazing. these flats are so fun! I'm a follower! And I am SO in love with these. Yay for Day 2! I'm a follower of Sometimes Sweet on bloglovin'. Nicholas - xachoiceformex@gmail.com . . . my wife would LOVE these! These are super cute! Love the color! I love orange! Great summer flat. i need these flats! my husband is the same height as me, so platforms do not exist in my life. 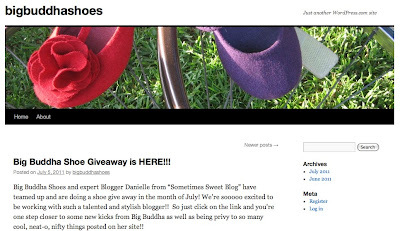 I live in flats, so this giveaway is perfect! The kimie pair are super cute too! And I LOVE the colour of these! How much would these brighten up a jeans and tee combo? So sweet & a beautiful colour! After seeing these shoes I am convinced I need orange shoes! Thanks they're precious. Ooh, I need some new flats! These would be perfect to wear while teaching! Very cute! I follow your blog. I adore these shoes! I NEED them to make my style more hip and colorful! pick me, pick me! So cute! I'm a follower. Ah, so cute :) love the style. Following! So cute!!! And I'm a follower! They are some seriously cute shoes!!! I love these flats. I have the zig platforms from the last giveaway and oh my! i love big buddha! love these! flats are the best! Im a follower on Google Reader! I'm loving these shoes even more than yesterdays. Oh My I just sent a link to these very shoes last week to my sister, I'm hoping she will wear them in my wedding in september. It would be super awesome if I could give them to her instead! I may just enter every draw, I'm hoping the shoes continue to get cuter! I'm a follower via google reader! ooh, such cute summertime shoes! OH! I really like these! oh these are even cuter than yesterdays! I love the coral color! Oh my! This flats are just adorable! I am a follower and those are cute shoes! wow those are so cute! i always wear flats cause i'm 6ft tall haha. following! Ahh! These are super cute! BTW, I'm a follower of your blog. love them, they even match a shirt I just bought! I also just tweeted (@jessicavignola). Oh how i love shoes! Oh baby, these are mouthwatering! love 'em! great color for summer time!